*closing transactions incur the following applicable fees: Options: $0.10 clearing fee per contract; Stock: $0.0008 clearing fee per share; Futures: $0.30 clearing fee per contract + exchange fees. Perhaps the best aspect of tastyworks is their commission structure. You only have to pay a $0.10 clearing fee and the exchange fees (exchange fees need to be paid regardless of which broker you choose). Although it’s not heavily advertised, there are online brokers like TD Ameritrade that don’t charge commissions to close out short options positions with a value of $0.05 or less. This is because it is more of a risk to the brokerage firm to leave these positions on than to close them out for no cost to the client. *All opening and closing transactions incur the following applicable fees: Options: $0.10 clearing fee per contract; Stock: $0.0008 clearing fee per share; Futures: $0.30 clearing fee per contract + exchange fees. The tastyworks trading platform is two-fold. There is a downloadable platform for both Mac and PC, and then there is a browser-based version. Looking at the downloadable platform, we were immediately impressed. 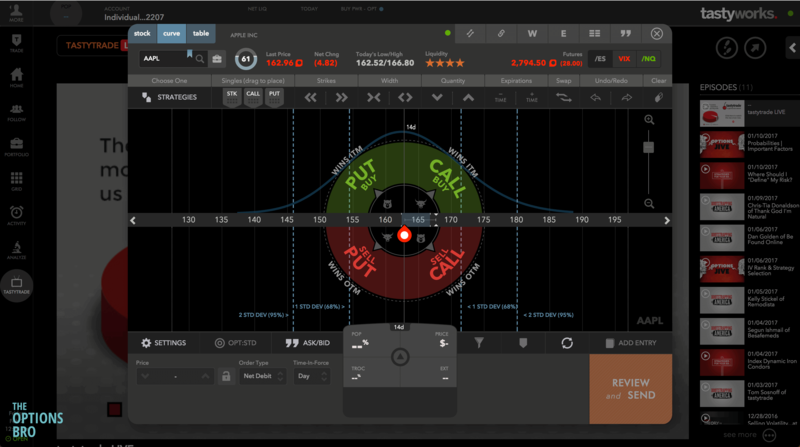 Technical analysts will be fond of the charting capabilities on tastyworks’ platform. A variety of studies and indicators are available. In terms of the options chain, options price data loads very quick and buy/sell trade tickets are easily created from clicking on bid/call prices. Options analysis is also available before or after placing a trade, to check things like potential profit/loss, theta decay, net delta exposure, etc. 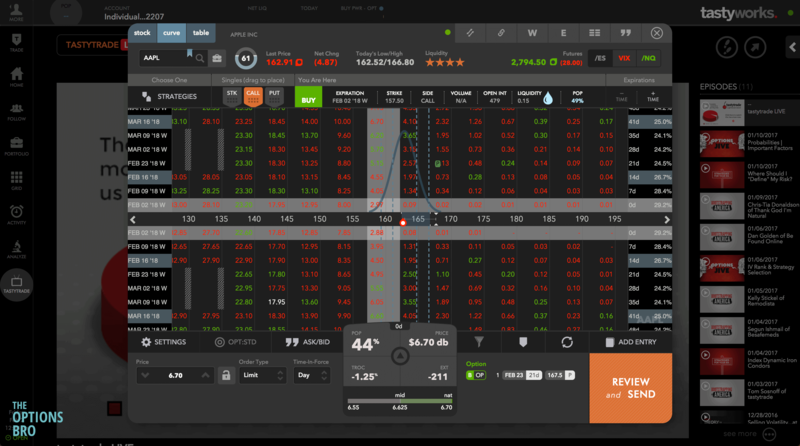 Overall, we think the downloadable tastyworks platform is one of the best pieces of trading software on the market. It’s slick, customizable, very capable, and very user-friendly. It is also free; there are no software or data fees. We really want to give tastyworks a five star review for their web-based platform, but we simply cannot. We found ourselves very confused when we first signed in. This really isn’t the biggest issue ever, because we prefer to use the downloadable platform. Nonetheless, take a look at the options chain. This monster seriously took us a minute to understand what the heck was going on. Out of all of the option chains in the world, this one is might get the award for the most complex. Once we figured out how to select expiration dates and strike prices, we had an easier time creating orders, but it still seemed unnecessarily complicated. 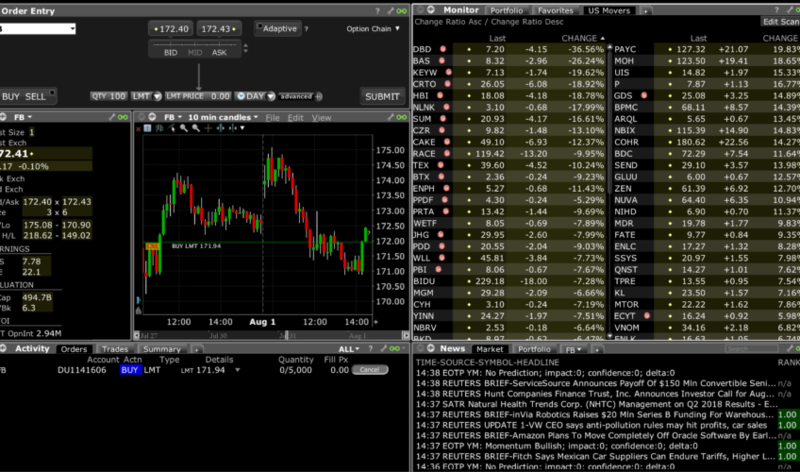 We found the colors of option prices almost distracting, and the grey bars in the middle of the chain seemed to add to the visual chaos. However, we like the liquidity rating feature, which quickly displays how liquid a given security is, which is really important for options traders. 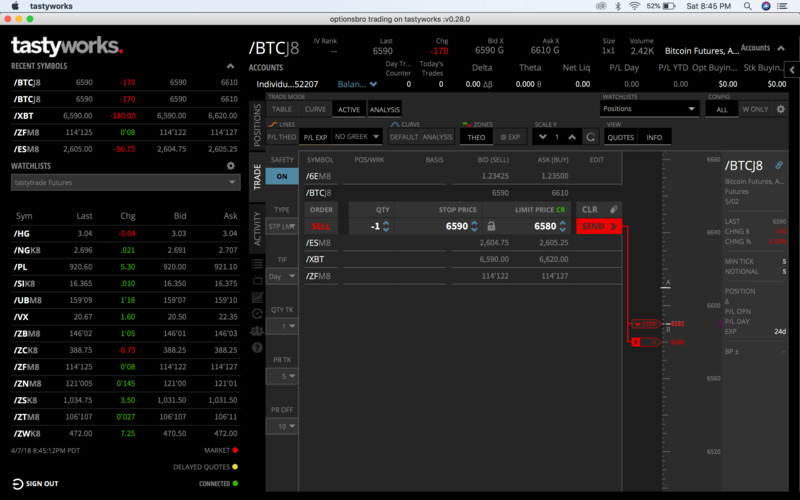 Although, one could also look at an options chain and quickly determine liquidity by the bid and ask spreads, but perhaps tastyworks needs the liquidity feature because their options chain is so complicated. Like the options chain, the “trade” tab was also something we have never seen before. We imagine this would be phenomenal software to use once you’re used to it, but the browser-based software learning curve is shockingly steep. Typically, it’s the other way around. The browser-based version of the platform is easy to understand and the downloadable version is more advanced and difficult. One feature that we really enjoyed was the grid page. 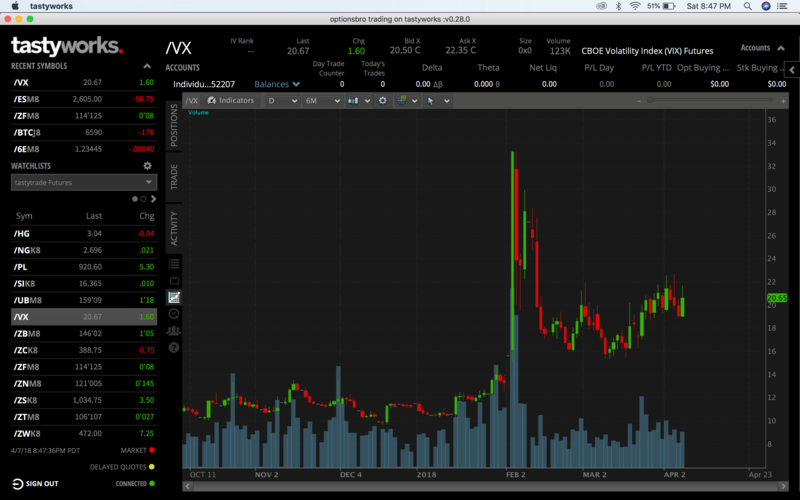 This page displays notable stocks by implied volatility. Lot’s of option sellers look to capture premium by selling options with high implied volatility, and tastyworks, being an “online brokerage for the active options trader” evidently realizes this. 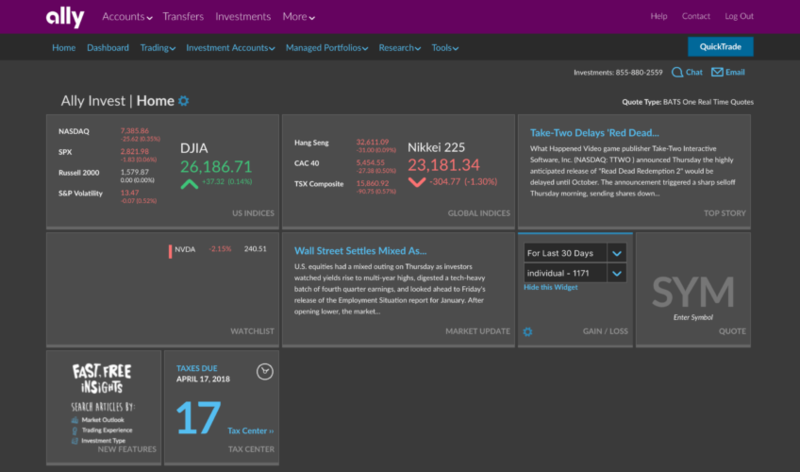 Simply put, this is a very helpful feature that saves time and enables traders to filter and identify stocks based on specific volatility criteria – pretty cool. 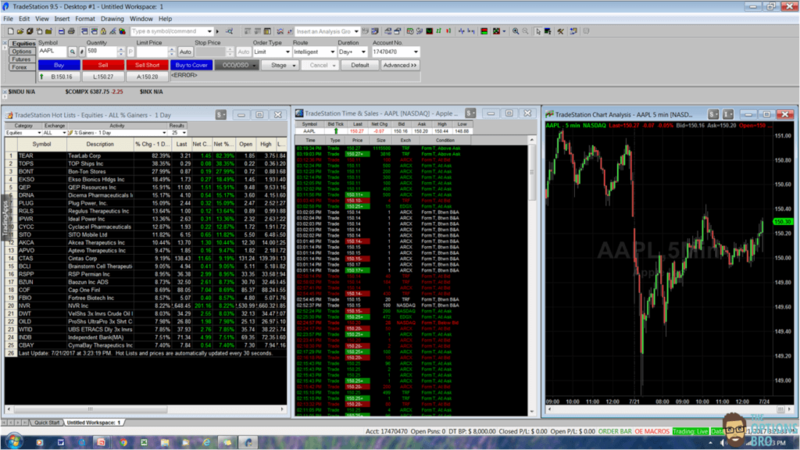 Mobile trading with tastyworks is pretty sweet. 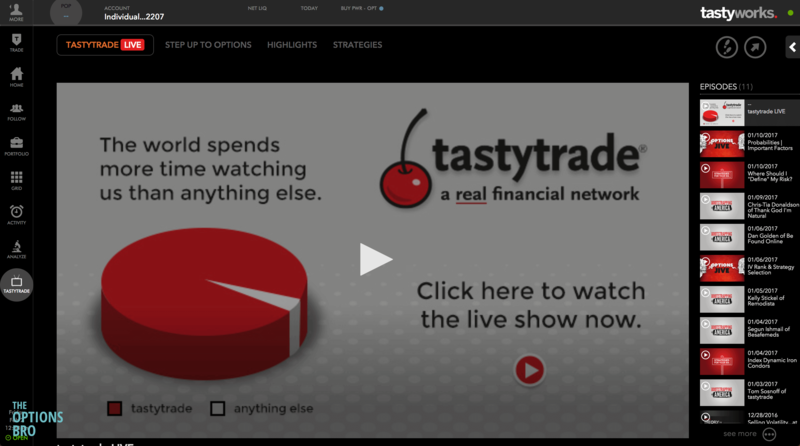 If you follow the tastytrade network and watch their shows, the mobile app provides the ability to watch live episodes and see recent trades placed by tastytrade employees. In the Apple App Store, the tastyworks reviews are somewhat mixed. It gets four stars overall, but some users pointed out issues with compatibility on iPads and larger screen devices. One thing that we noticed, is that someone from TW individually responded to each negative review, something that you rarely see with larger companies that have mobile apps. One thing that is pretty evident while using the mobile app, as well as the web-based platform, is tastywork’s deliberate attempt to make their software visually appealing and innovative to new traders. 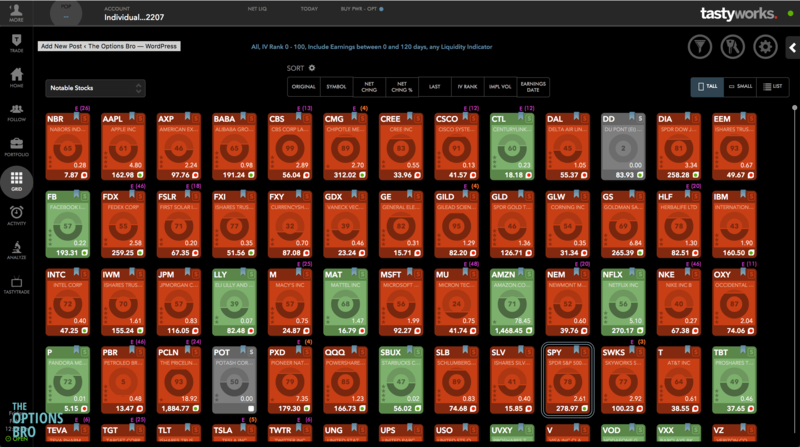 We love the concept of creating trading software that doesn’t resemble an Excel spreadsheet, but tastyworks takes this to the next level, and it might be too much for some users. At the end of the day, we prefer to not be bombarded with flashy quotes, large images, and oversized buttons – simple mobile trading platforms have always been our favorite because they’re fast and convenient; every user interface with TW seems to have a learning curve, which is likely not intended. Overall, we think the mobile app is pretty slick and user-friendly. One feature that is pretty cool is the list of basic options strategies for users to choose and trade with only a few clicks/swipes from within the app. 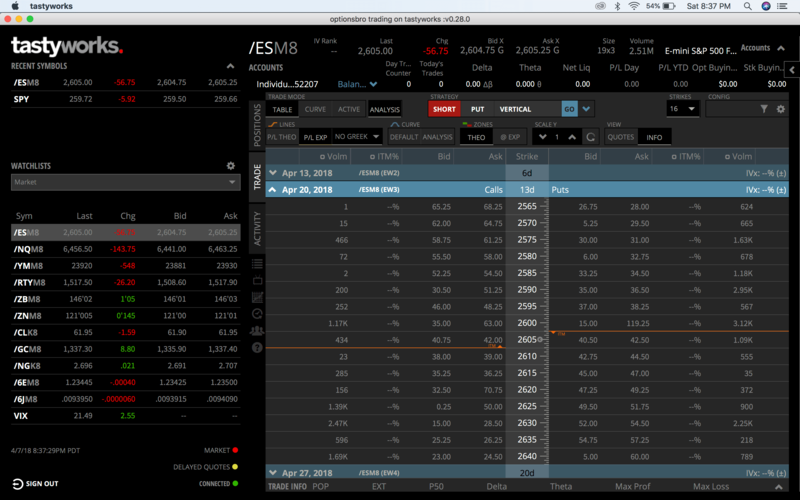 For example, you can select to trade an iron condor on Apple stock, and tastyworks sets up the strikes for you. Since tastyworks is not a massive brokerage firm like TD Ameritrade or Etrade, their customer service is subsequently not as well-staffed and could potentially use some improvement. 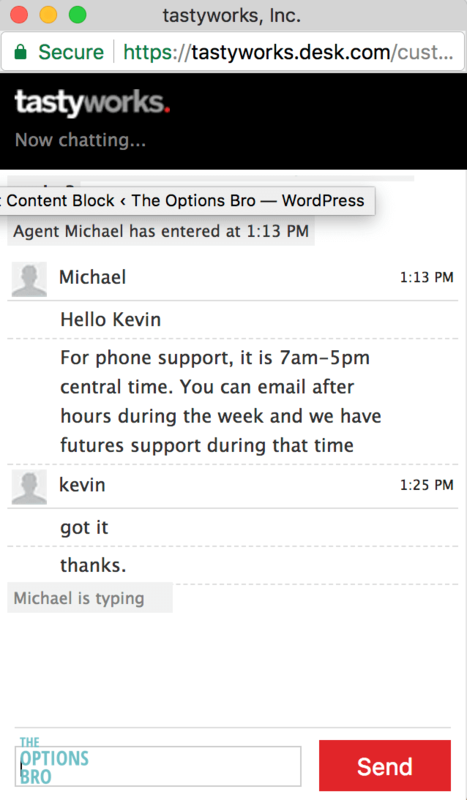 Customer service is available 7am to 5pm central time Monday through Friday over the phone and live chat, but we experienced significant delays in agent response times when we had trading related questions while using the live chat. 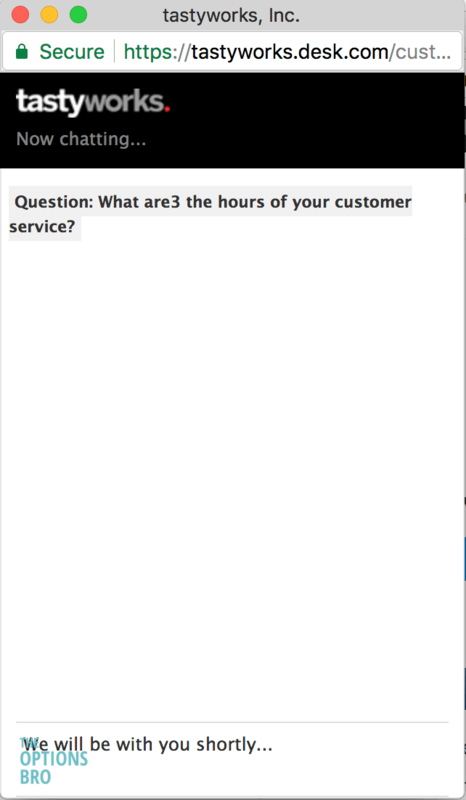 When we initiated a chat request, we waited for approximately five minutes before receiving a response from a customer service agent. Although that may not seem like a lot of waiting, whenever we use the live chat feature with TD Ameritrade or Ally Invest, response times are usually within the minute. Somewhat slow response times from tastyworks customer service isn’t a that big of a deal, and it’s definitely not a good enough reason to avoid the broker altogether. It’s just something to be mindful of if you’re ever having a problem with your account during market hours and need prompt assistance. If you’re looking for comprehensive research on stocks, you won’t find it with tastyworks. Almost every online broker offers free stock research to clients that includes analyst reports, analyst upgrades and downgrades, market updates, etc. Unfortunately tastyworks doesn’t seem to provide this at all, but we really didn’t mind. Since TW is evidently more focused on options trading and technical factors like implied volatility, stock market research is of little to no importance. Instead, they offer quite informative and comprehensive how-to tutorials about options trading, futures trading, and the like. Their online media content, created and distributed through their parent company tastytrade, attracts tons of viewers everyday who are curious about the trading activity of the multi-millionaire CEO and veteran options trader Tom Sosnoff. 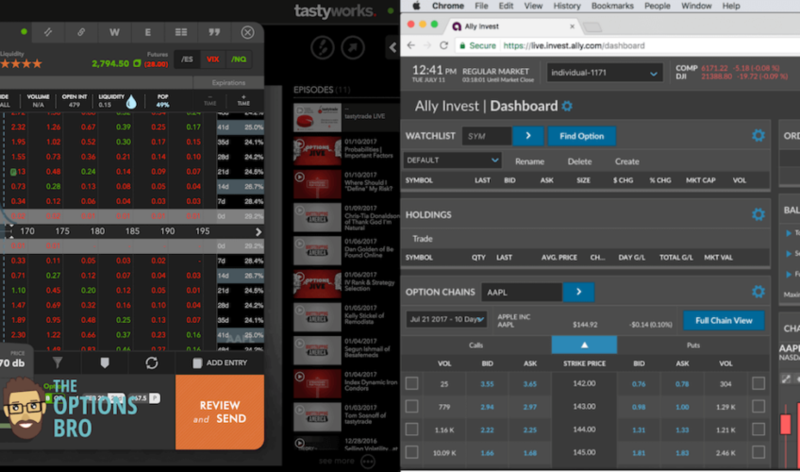 When you’re logged into the tastyworks platform, you can absorb all of the tastytrade content directly without having to open up a new tab in your browser. It seems like a slight conflict of interest that the owner of an online brokerage firm and all of his employees, consistently display how many trades they make for a given day, but never disclose their profits, given that the primary way they make money is via client commissions. Nevertheless, we think their content is, on the whole, educational and empowering to the DIY investor and significantly better than anything you could find on a traditional financial news network like CNBC. At the end of the day, our final tastyworks review and rating, after accounting for desktop/mobile trading platforms, commissions, customer service, and research is a solid 4/5. A full list of the registered brokers who work for tastyworks can be found on FINRA’s BrokerCheck tool here. It doesn’t seem like you can go wrong with $0 commissions to close stocks and options, a free downloadable platform, no inactivity or maintenance fees, and no account minimums. There are only a few online brokers who offer per contract options pricing with no ticket charge, and since tastyworks only charges $1.00 per contract with no closing commissions, the effective per contract rate is $0.50. This rate is almost unbeatable for small trades of 1 to 10 options contracts. If you’re an active trader, you’ll probably love tastyworks. Not only is the tastywork’s software specifically designed for active portfolio management, but the commissions and fees are also geared towards active traders. Since all closing trades for options, stocks, and futures options are $0, you really don’t have to worry about commissions with tastyworks. Even if you plan on trading infrequently, but you still want access to solid trading platforms, thousands of hours of educational trading videos on tastyworks, and very low commissions, tastyworks is a top choice. The developers from tastyworks have responded to most of the feedback (both positive and negative) in the App Store. This is good news, because it is indicative of a brokerage with a focus on customer feedback that is willing and able to make changes to keep the customers happy. We are very fond of the tastyworks mobile app, and it seems that other people are as well.